Expert inventory managers understand and regularly monitor their inventory. This includes reviewing patterns of inventory holdings, where inventory is held, trigger levels, delivery patterns, wastage rates, and usage rates. All of this information can be examined using the BloodNet reporting features at www.blood.gov.au/bloodnet. Research has shown that having staff that are well trained can have an overall positive effect on inventory management and reducing wastage. You should ensure all staff involved in the handling of blood products participate in a well-designed training program. Your hospital’s medical officer induction program should include a session on blood use. There is a strong relationship between inventory levels and wastage. Hospitals and laboratories that hold more blood products relative to their average daily use often have higher wastage rates. The trick is to balance having sufficient inventory to meet clinical need while keeping wastage rates at a minimum. Each health provider is responsible for setting their own inventory levels and ensuring those are appropriate. Simply doing a physical count of your inventory on a regular basis and setting trigger ordering levels can prevent staff from placing unnecessary orders and therefore having excess inventory. You can take advantage of the Minimum Order Quantity feature in BloodNet to help implement trigger points for orders. Planning ahead can also help. If possible ask hospital clinicians to provide you with details of blood product requirements in advance. Having good relationships with everyone involved in the supply, handling and use of blood products can help with managing inventory. You should encourage clinicians to understand the inventory and ordering process to minimise the number of unnecessary orders that could lead to product unavailability. When new product enters the inventory it should be sorted to allow it to be issued on an oldest-product-first-out basis. Options to consider if you believe product is getting close to expiry might include transferring to another hospital or laboratory, rotating segregated inventories where possible and highlighting to others product that may be soon to expire. Consider electronic crossmatching for red cells in conjunction with a Group and Screen or Maximum Blood Order Schedule (MBOS) policy for patients without clinically significant antibodies. Remember that each time blood is reserved as cross-matched for a patient; this blood is removed from available inventory. Where blood has been reserved for a patient, consider short reservation periods such as 24 hours only. All equipment used for the storage and handling of blood products, such as refrigerators, freezers and plasma thawers should be maintained and monitored in accordance with relevant standards and guidelines . You should have a plan for backup storage arrangements in the event of any equipment failure to prevent the loss of product. Where inventory levels are running low, you should have a plan for what to do to conserve product should the need arise. Develop local policies concerning the management of contingency events. Before the decision to transfuse is made, all of the risks, benefits and alternatives should be considered. There may be another, more appropriate product or treatment that can be used. 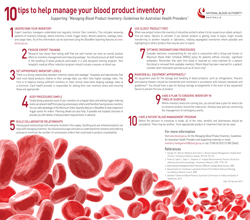 Visit www.blood.gov.au/inv-mgt-guideline for the Managing Blood Product Inventory: Guidelines for Australian Health Providers and supporting materials or email support@blood.gov.au or call 13 000 BLOOD (13 000 25663). 1. Stanger SH, Yates N, Wilding R and Cotton S. Blood Inventory Management: Hospital Best Practice. Transfusion Medicine reviews, 2012, 26:153-163. 2. Perera G, Hyam C, Taylor C, Chapman JF. Hospital Blood Inventory Practice: the factors affecting stock level and wastage. Transfusion Medicine, 2009, 19:99-104. 3. Blood Inventory Management Best Practices. ORBCoN, Canadian Blood Services, 2008. 4. Requirements for Transfusion Laboratory Practice (First Edition), National Pathology Accreditation Advisory Council, 2008. 5. Standard 7 Blood and Blood Products, Australian Commission on Safety and Quality in HealthCare, 2012.